the tarot card «the child» represents eagerness to experiment, desire to discover new frontiers and accepts confrontation with new and unknown things. in a carefree manner, full of joy of life, adventurous, the child jumps across the river - over which a tree-trunk lies, to new unknown banks - the water edge. the child is followed by a little spitz, vigilantly warning it about impetuous acts and danger. the tarot card «the child» represents eagerness to experiment, desire to discover new frontiers and accepts confrontation with new and unknown things. Starting new like children to discover our environment free and open-minded - without any prejudice. Life seems to be a big adventure, we are confident of life and we are looking forward in an optimistic way. Besides the card shows a strong desire for liberty, movement and changes. Principles are spontaneity and genuineness. The tarot card «the child» request us to enjoy present while jumping forward and choose instinctively our own way. The child communicates to be careful and gives the advice not to act thoughtless in a non-reflected way that matters most disadvantageous. Yet all that looks alluring but it does not offer effectively better opportunity. Act carefully and do reflect with regard to your decision. Take care and do not ignore experience, knowledge and intuition. It would be dangerous to overlook these attributes. Negative aspects of this card shows volatility, lack of responsibility, being naïve and childishness. Charming, full of life, joyful and open minded: by this mélange there will be no challenge to come to know to new contacts and experiences! But this does not last for long. 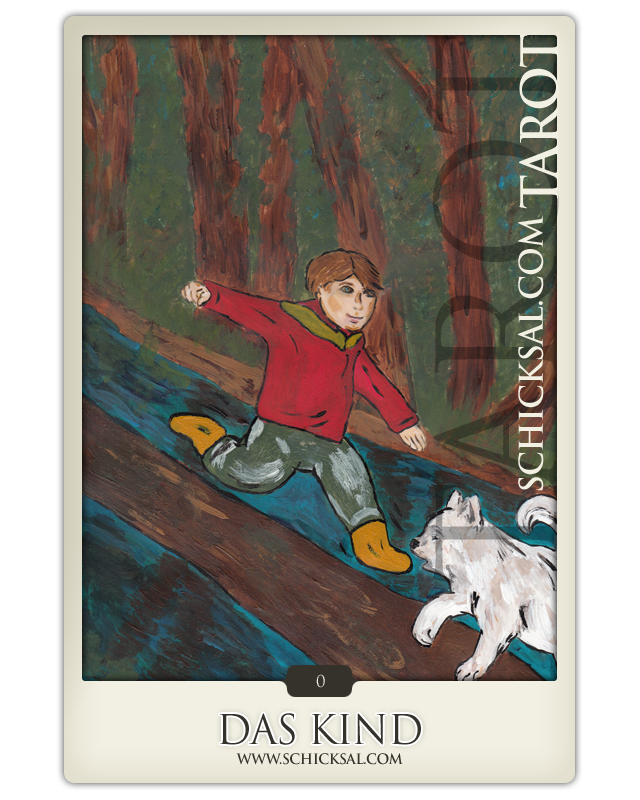 The child in tarot goes ahead with a strong desire for freedom and being curious to new forms of validity and experiences. Serious relationship and keeping rest is no topic at that time. Moreover the Child stands for passionate love affairs, intensity and enthusiasm. Existing relationship and cooperation are refreshed. Thirst of knowledge and curiosity are our motivation. The tarot card Child represents a phase when you like to go on a journey. We are a kind of scientists and go on a discovery trip, a journey of initiation. We are ready to experience knowledge. We are confronted with new challenges. But this card means just point of departure, point of beginning. You are still a child and not a professional one, but it is our motivation to create something distinct, something new. Take care and respect regarding responsibility and naivety. Surprising twist or you get new experiences of life. Today you should be prepared and give in new challenges. You sense like being young and free – fully enjoy that time and start anew! But do not neglect to look left or right – maybe there is a chance to miss.